Omigosh, I have been having a hankering lately for a naughty maple bar donut and brownies all at the same time, knowing that I cannot have that wheat donut, I decided I better come up with an alternative quickly to curb my cravings, and that I did. Just look at that masterpiece up there! A Gluten Free Vegan Maple Brownie Bar to be exact, I made a blondie type brownie with a maple frosting. I went to pick up my daughter from school and when she got into the car she says "Mom what have you been baking, it smells like maple." Yes maple brownie bars, just enough to satisfy any cravings that I had. Enjoy! Grease an 8x8 baking dish with non stick spray, set aside. In a medium sized bowl add, brown sugar, cane sugar, maple sugar, baking powder, and sea salt. Add melted shortening, water, maple extract, vanilla extract, and gluten free flour. Thoroughly mix all ingredients and pour batter in greased baking dish. In a stand mixer add, confectioners sugar, shortening, butter, maple extract, vanilla extract, and 1-2 teaspoons coconut milk. Mix on medium high speed until frosting becomes light and fluffy. Frost cooled brownie bar and top with SO Delicious Creamy Cashew Milk Ice Cream. You must be joking...this is what us vegan/gf's dream about! Amazing! I am going to be thinking about these treats all weekend! 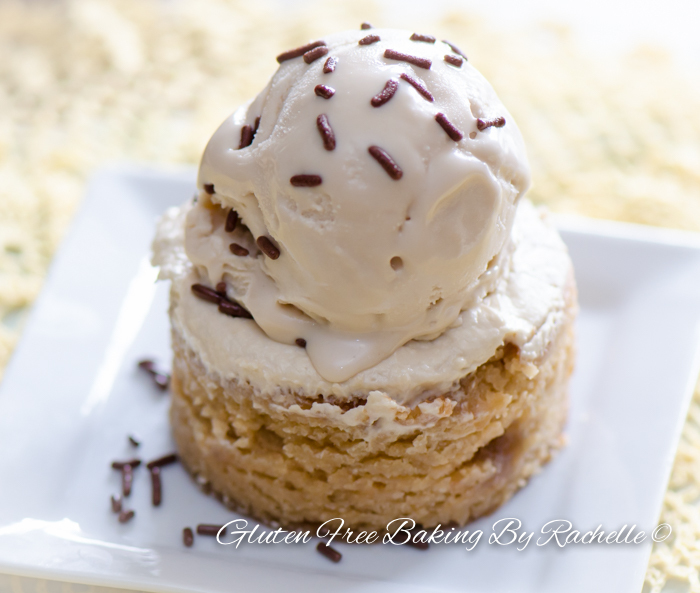 What a glorious gluten free way to satisfy those cravings!